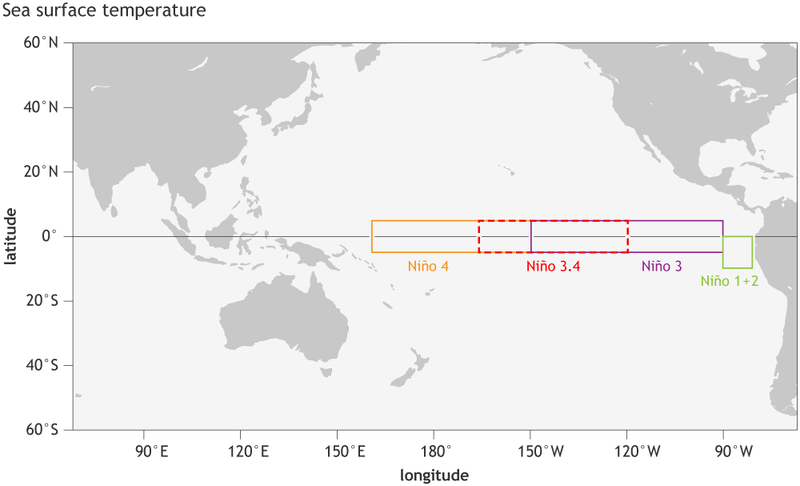 On the second Thursday of each month, scientists with NOAA’s Climate Prediction Center in collaboration with forecasters at the International Research Institute for Climate and Society (IRI) release an official update on the status of the El Niño-Southern Oscillation (ENSO). Here is a description of the categories and criteria they use. Watch: Issued when conditions are favorable for the development of El Niño or La Niña conditions within the next six months. Advisory: Issued when El Niño or La Niña conditions are observed and expected to continue. Final advisory: Issued after El Niño or La Niña conditions have ended. Not Active: ENSO Alert System is not active. Neither El Niño nor La Niña are observed or expected in coming 6 months. increased cloudiness and rainfall in central or eastern part of the basin and a corresponding drop in the average surface pressure. Summary of decision process in determining El Niño conditions. NOAA Climate.gov drawing by Glen Becker and Fiona Martin. a decrease in cloudiness and rainfall in the eastern tropical Pacific, and an increase in the average surface pressure. sub-surface heat content and Kelvin waves.